Qatar 2022: Nine stadiums instead of twelve? 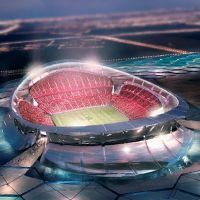 Financial firm Bank of America Merrill Lynch revealed to its investors that Qatar may be facing rising costs (likely to exceed the $95 billion preparation budget) and has thus asked FIFA to approve a smaller number of stadiums. Instead of 12 submitted in the winning bid the small emirate wishes to prepare 8 or 9. In response to a BofA Merrill Lynch report, technical director Yasir Al Jamal, said that plans were currently being reviewed before being submitted to FIFA's executive committee. "This is the same process for any FIFA World Cup and has also been applied to previous editions." He said that the requirement for hosting the world cup is to deliver "a minimum of eight and a maximum of 12" stadiums.